4Friends Games brings the latest thrilling legend to life in Living Legends: Fallen Sky! Living Legends: Fallen Sky is rated 4.6 out of 5 by 7. Rated 5 out of 5 by afarrell from A great game for all ages Big Fish this is a great game. Lately I had been disappointed as games I had bought some time ago ceased to work. This game after playing the Demo proved to me how far games have come from the early gaming days. This game is about Jack and the Beanstalk, but the graphics are so clear and the story line keeps you interested from beginning to end. It also has a HO level from beginners to the professional. Play the demo and you will find it is a game you must have to keep in your collection. Rated 5 out of 5 by peachlizard from fee fi fo FUN this is one of the funniest games I have ever played--there are so many things to laugh at--mostly some of the things the characters' say kinda made me wet my beans!! [sorry] I WHOLE HEARTEDLY RECOMMEND THIS GAME! TRY IT, YOU'LL LIKE IT! Rated 5 out of 5 by 2020moonlanding from Care-free Breezy Good Time What a charming game! I love the fact that there is a ton of things to do at each location... none of this going back and forth all the time. The story is imaginative where the graphics, cutscenes, and voice acting are spot-on. 4Friends has become one of my favourite developers and this game is a wonderful addition to the Living Legends series. As with many of their games they have the same sound track and sound effects unique to them which I enjoy. As a casual player this game is perfect, the HO scenes and the mini-games are breezy fun without the need to skip through in frustration. Rated 5 out of 5 by biscuitsmama from ANOTHER FAVORITE FAIRY TALE COMES TO LIFE The game is based on the jack and the beanstalk tale. You play the game as Jackie Grant whose brother Edward is a very successful young botanist who has recently made an incredible discovery and he wants to share it with you. Edwards’s letter asks you to meet him in the town of Etherfall but when you arrive you are greeted with a disastrous scene and Edward is missing. As you begin your search for Edward and you meet Grace, you find that Edward by his discovery has unleashed a terrible fate for the Etherfall unless you can intervene. Off you go on a search not only for Edward but one for something more precious that just might save the town and its residents. I love “The Fallen Sky” and if you are familiar with my reviews you might know that the Living Legends series is a favorite of mine. For me the Fallen Sky does not disappoint and I have had a long night of playing the game since it was released. As a child I loved my huge book of fairy tales and the story of Jack and the Beanstalk was one I loved. I guess I developed my love of fairy tales as my grandmother would always read one for me each night until I learned to read and then we would read them together. Now with the advent of computer games and some of the adaptations of those beloved stores that we receive here at BFG I can relive some of my fondest memories from childhood. The Fallen Sky is a game that can be shared by the family and one that will become a favorite as they play this retelling of the Jack and the Beanstalk tale. The game offers four game settings to choose from when you begin. Since I don’t like a lot of help along the way I appreciate being able to turn off sparkles and helpful text. There is a helper in the game that lives right on the right side of your inventory area and he will help you in certain situations. Of course, you will need to play a puzzle each time he is used but it is fun and not difficult. The HOPS are so much fun and my favorite is found early in the game as I searched for items in a baby hedgehog. In general the HOPS are familiar and nothing new but they are so creative and well-designed that they were, for me at least, some of the best things in the game. Yes, I love puzzles and I found the ones in the Fallen Sky easy but very entertaining. Sometimes I skip puzzles when I play a game for the first time but I didn’t want to skip any in this game because they were fun to solve and fit well into the game’s storyline. Although many of the puzzles were easy there were several that I found a bit more challenging. 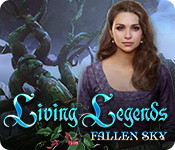 Living Legends: The Fallen Sky is a game that I highly recommend if you love a new spin on a favored fairy tale or if you happen to enjoy a well-crafted game. I found the game to be entertaining, at times humorous, and sometimes challenging. I enjoy a game that holds my attention and keeps me involved in the storyline as I play and the Fallen Sky fit the bill for me as I tried to find Edward and save the residents of Etherfall. Even though the Fallen Sky is the perfect game for me and the way I like to play but, as always, please try the demo to see if it is one you will enjoy as well. Happy gaming! Rated 4 out of 5 by pennmom36 from WHAT DOES FIE, FI, FO, FUM MEAN ANYWAYS? Fallen Sky is an excellent game that I thoroughly enjoyed from start to finish. Personally, I prefer the Collector's Edition version over this Standard Edition but that's because I love 4Friends collectibles and morphs, but if you can live without them, this version is perfectly fine, and this is a must-have game! As I mentioned in my CE review, I was somewhat disappointed in the quality of graphics, I don't know if it was a "hazy look" they were trying to achieve to mimic what life would be like living high in the sky, or if they just didn't spend as much time perfecting the graphics as they did in their last release of a different series. I went back to the previous games in this series to see if I was imagining awesome graphics, and sure enough, they were indeed pretty amazing. Even looking at the screenshots of Ice Rose from 2012, they looked amazing, so I'm not sure of why they chose to go with hazy looking graphics. Unfortunately, there is a Gadget used in Fallen Sky, a Wooden Box with a wooden talking cat named Basil. He will help remove curses so you can collect all the stolen treasures and return them to their rightful owners in the Sky Kingdom of Giants. I found him to be rather creepy, but not in a good creepy way, like in a wicked scary way, but rather in a creepy-creepy way. I really didn't care for him because he wasn't cute so he didn't add an "awe" factor, to the game I just think they should have made him more appealing or at least cuter. The good news is that Basil's services are only used to lift four curses, which, unfortunately, isn't the case when it comes to the repetitive Chain type, Match 3 games that follow. The Match 3 games didn't present much of a challenge and because they were so simplistic, it was just a waste of time, including a Hard difficulty mode would have been much appreciated. In the Collector's Edition version each Location has 2 very well-hidden Opaque Cats to find (56 total-40 in the main game and 16 within the Bonus Chapter) that will shatter 7 different Crystal Glass Cats to reveal a different cat breed (5 in the main game, 2 within the Bonus Chapter) In the CE version, each location also has a Morphing Object to find. There are 28 total Morphs, the final 8 Morphs are located within the CE Bonus Chapter which takes you back several years earlier to the beginning when Giants were first discovered. The Hidden Object Scenes are mostly Interactive List Finds, especially towards the end, but there are also Multiples of the same item finds, Keywords in Sentence finds, finding areas that match Swatches and Matching Pair finds. Many of the scenes are repeated in the same location, a feature I'm not particularly fond of because it's just boring the second time around. 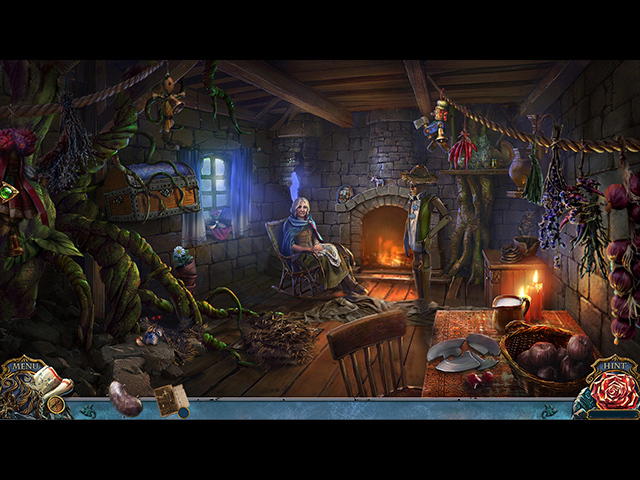 The scenes are clear and the items are recognizable, although one of the scenes had partially hidden objects. 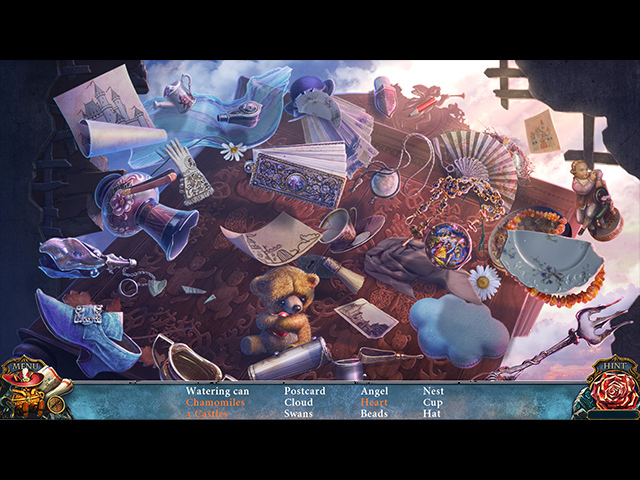 There is a total of 17 Hidden Object Scenes throughout the game, 4 of which are offered within the CE Bonus Chapter. The Mini-Games are rehashed versions from other games by this dev, and nothing new is offered, however, they are fairly entertaining puzzles and they are all "frustration-free" (no puzzles where clicking one affects others, which I really hate) There is a total of 18 Mini-Games throughout the game, the last three are within the CE Bonus Chapter. Below are brief descriptions of some of the games you'll encounter during and after the demo: 1-Select & drag feathers to create an unobstructed path for a key. 2-Select various weights to grow all bean stems to the top. 3-Chain type Match 3 game to collect a specific number of each gem. (repeated throughout the game) 4-Adjust joints of metal clock hands to point to specified times. 5-Select Bears to push each other along tracks to their matching slots. 6-Click arrows to select plates to show all symbols correctly. 7- Remove all icons by selecting them in a specific sequence. 8-Swap tiles to recreate 2 pictures using empty slots to move tiles to the opposite picture. 9-Swap fish bones to recreate the image. 10-Swap the order of fish & select play to check your solution. 11-Find the right way through the map in the same order. 12-Select adjacent sections to paint the picture correctly. 13-Swap fan sections to recreate the image. 14-Align the decoder until the correct codes appear inside the holes. 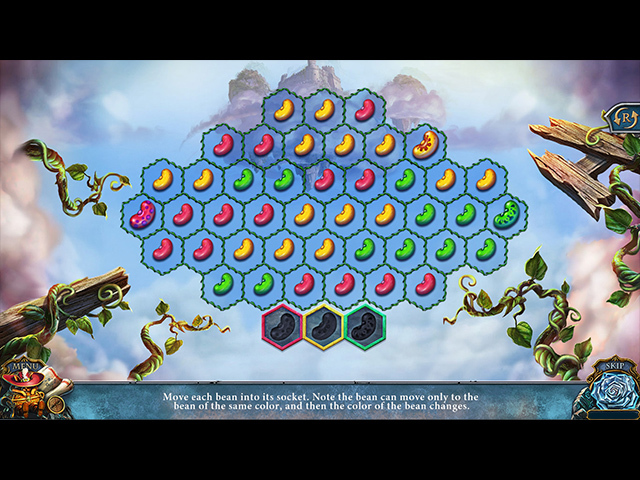 15-Move beans to their matching slots using the beans to recolor other bean paths. 16-Capture opponents pieces by touching or jumping the ball, yellow spaces add more pieces. The Collector's Edition version has 10 Wallpapers, 10 Concept Art Pictures, 4 Screensavers, 5 Music Soundtracks, 30 Movie Video Cutscenes (26 in the main game, 4 in the CE Bonus Chapter) 24 Achievements to earn, 17 replayable Hidden Object Scenes, 18 re-playable Mini-Games, 56 Hidden Opaque Cats, 7 Crystal Glass Cats to unlock with the Hidden Cats, 28 Morphing Objects, 5 Main Chapters +Bonus Chapter and a built-in Strategy Guide, enjoy the climb! Rated 3 out of 5 by Redau from *scratches head* Where IS This Exilarating Game? I should be outdoors down at the beach or something similar but still no sign of Spring------instead I read 3 reviews here *wow* They say this is a fun game? Good! Nice day to play a game for half an hour or so - *coughs* Well I finished demo and thanks now definitely need to get out-doors for fresh air to wake up as this boring, dull, ridiculous game very nearly put me to sleep. Honestly all I did was use the hint umpteen times, kept going back to the cat hoping for something? Clicked everywhere as there really was no sense or rhyme to this game, in other words its the same old, same old. The hedgie guy got me, hah maybe he's going to spring at me or something, same with the geese maybe they'll honk or hiss but no, these scenes and many of the others just fell flat. Isn't the idea of these games a rescue from scary, kidnapped, etc scenario yet the Hero or Heroine never fall over - give me a break. Can't these Hero(s) at least fall down a hole or something and try and get out like MacGyver? *lol* PS Recently I have gone back to the good old days of gaming, playing through my previously bought games from here, like the one added here, thank goodness for them.